Size reduction, or comminution, is a fundamental processing step for lignocellulosic biomass feedstocks used as a raw material for production of liquid transportation fuels (ethanol, butanol, biodiesel, biocrude, etc. ), solid biofuels, and biobased products. The predominant methods for comminution include rotary hammer mills, chippers and grinders of various designs. The attraction of such mass-flow comminution equipment is that they have high throughput and accommodate a wide range of feedstock forms. Major limitations for all these methods include a need for dry raw materials, high production of dust, excess production of overly fine materials, high power consumption, and broad distribution of particle sizes. These limitations result in feedstocks that reduce downstream yields and increase process costs. Forest Concepts has developed effective methods and equipment for processing biomass raw materials into feedstocks having more uniform particle size distribution, less fines, and higher surface activity, all while consuming less energy during comminution. The Forest Concepts comminution methods work well with high moisture and green raw biomass which offers particular benefits to those apply biochemical pretreatment or otherwise desire high moisture feedstocks. Dooley, J.H., D.N. Lanning, and C.J. Lanning. 2013. Woody biomass size reduction with selective material orientation. Biofuels 4(1):35-43. 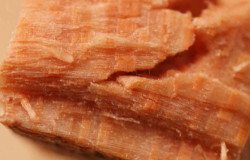 Roundwood logs from forests and energy plantations must be chipped, ground, or otherwise comminuted into small particles prior to conversion to solid or liquid biofuels. Results & discussion: Rotary veneer followed by cross-grain shearing is demonstrated to be a novel and low energy consuming method for primary breakdown of logs into a raw material having high transport and storage density. 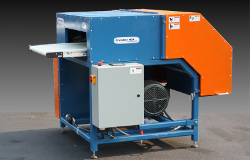 Processing of high-moisture raw logs into 2.5-4.2-mm particles prior to drying or conversion consumes less than 20% of the energy required for achieving similar particle size with hammer mills, while producing a more uniform particle shape and size. Conclusion: Energy savings from the proposed method may reduce the comminution cost of woody feedstocks by more than half. Dooley, J.H., C. Lanning, and D.N. Lanning. 2011. Modeling energy consumption for crushing of roundwood as a first stage of feedstock preparation. ASABE Paper No. 1111085. St. Joseph, MI: American Society of Agricultural and Biological Engineers. Our objective is to apply an understanding of the modes of failure and structural biology to substantially reduce the comminution energy required to produce bioenergy feedstocks. This paper explores the modes of failure for wood materials subject to crushing forces and how they could be used to develop a mathematical model of crushing forces for a round roller acting on a round log. Our hypothesis is that crushing or roller-splitting is a low-energy and effective method to reduce the thickness of round logs and change the resulting shape for subsequent processing. Modes of failure during crushing suggest that a mathematical model could be developed to estimate required crushing forces and energy for round logs. Such a model has been called for since early work by the USDA Forest Products Laboratory and Tennessee Valley Authority more than 30 years ago. A model was developed by the authors and experimentally validated for the case of a round roller compressing a round log. Lanning, D. N., J. H. Dooley, and C. J. Lanning. 2012a. 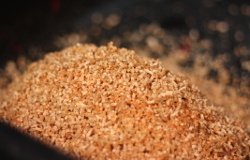 Low-energy comminution of woody biomass to create precision feedstock particles. ASABE Paper No. 12-1337409. 10. St. Joseph, MI: American Society of Biological and Agricultural Engineers. Under funding from DOE Office of Biomass Programs, engineers at Forest Concepts are working to apply low-energy comminution methods to produce improved biomass particle geometry and sizes optimal for biochemical and thermochemical conversion to liquid transportation fuels. Designs are constrained to concurrently achieve the DOE Uniform Feedstock Format criteria for bulk handling and flowability. The innovative comminution process independently controls shearing of biomass feedstocks parallel to the fiber orientation and cross-grain. Short-length cross grain shearing opens particles to high mass transport and eliminates fiber balls and other materials handling problems typically associated with hammer milling. The process is currently operating routinely at laboratory scale (200 kg/shift) on woody materials at a roundwood to 2mm cubic particle at a specific energy cost of approximately 150 MJ/odMg. Dooley, J. H., D. N. Lanning, and C. J. Lanning. 2012. Beneficiation of chipped and shredded woody biomass. ASABE Paper No. 12-1337408. 11. St. Joseph, MI: American Society of Biological and Agricultural Engineers. Forest Concepts, with funding from USDA NIFA SBIR program, developed methods and equipment to reprocess low-value dirty forest chips, tree service chips, and hog fuel into high value clean wood fiber and other valuable fractions. Traditional clean sources of mill residuals (sawdust, shavings, and chips) are declining rapidly due to improved sawmilling efficiencies and a general decline in the number of sawmills in operation. Thus, competition for low-cost clean fiber is intense. A USDA NIFA SBIR supported beneficiation project sought to increase the clean fiber supply by tapping low grade, often inexpensive or negative cost raw materials. To validate the SBIR funded engineering science work, our engineers designed and built a set of demonstration-scale (one ton per hour) machines that can be mixed and matched to clean low grade woody biomass to meet nearly any ash or bark content specification. Results of validation tests demonstrate the performance of innovative methods for cleaning high-ash land clearing debris. Lanning, D.N., C. Lanning, J.L. Fridley, J.H. Dooley, M. DeTray. 2008. Mode of failure model for cutting solid section biomass. ASABE Paper No. 085111. ASABE. St. Joseph, MI. 20 pp. Solid section biomass, such as wood and the node-zone of crop residues, has distinct modes of failure when loaded in cross grain shear. Shear bar design plays a part in determining what the failure mode will be at a given depth of penetration. Other factors include shear location relative to an unconstrained end and species type. In order to design a low energy consuming shear bar for agricultural and industrial machinery such as balers and choppers, one needs to develop a predictive model of the failure modes to minimize energy consumption. Utilizing a purpose built instrumented shear test apparatus, we have developed a set of equations and a governing model to predict failure mode and force required shearing solid section biomass. Our tests involved multiple cross sectional areas, 3 shear bar designs, and multiple cross sectional shapes.